Pinkberry is celebrating its 10th anniversary with a trio of limited-time flavors — Sea Salt Chocolate, Passion Fruit and Raspberry White Chocolate — and by offering small cups of frozen yogurt with toppings for just 10¢ from 7 p.m. to close tomorrow (January 30). However, there’s a catch on the 10¢ deal. The promotion is only available at a limited number of participating locations, and none of the Inland Empire locations — Rancho Cucamonga, Mira Loma, Chino Hills and Corona — are on that list. Chipotle Mexican Grill is giving away free food in a promotion for the restaurant’s Sofritas, its organic tofu filling. But before you head on over and demand a burrito, here’s how it works: Simply head to any location today (January 26) and order any entrée with Sofritas. Then simply bring your receipt back any time between Tuesday (January 27) and February 28 and you’ll get a free burrito, salad, bowl or order of tacos. Pretty simple, huh? It’s a deal even carnivores can enjoy. Chipotle Mexican Grill restaurants can be found throughout the Inland Empire. Downtown San Bernardino’s Third Thursdays Food Fest returns tomorrow (January 15). At least five Eight food trucks are scheduled for the popular monthly event, which takes place from 11 a.m. to 2 p.m. in the city hall parking lot on Court Street between D and E streets. Among the returning trucks are: Bacon MANia, Piaggio on Wheels, the Greasy Wiener and the Mocha-Lotive Express. Joining them for the first time is Crepes Bonaparte. The Coffee Bean & Tea Leaf will be showcasing its new Mexican chocolate beverages during its latest open house, 2 to 6 p.m. today. During the open house, guests can choose any of three small beverages for just $2: Mexican Chocolate Ice Blended, Mexican Chocolate Latte or Mexican Hot Chocolate. 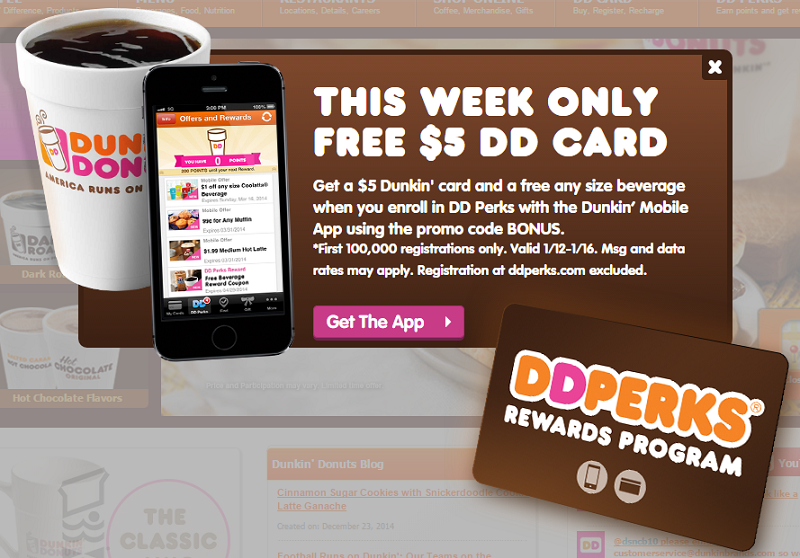 Dunkin’ Donuts just started a promotion to get folks to sign up for its DD Perks loyalty program. 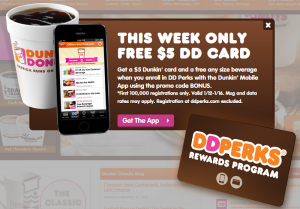 The first 100,000 people to sign up for the program via the chain’s mobile app will receive a free $5 card in addition to the free beverage normally given out with new memberships. Simply use the promo code BONUS when you sign up. The deal expires Friday (January 16).